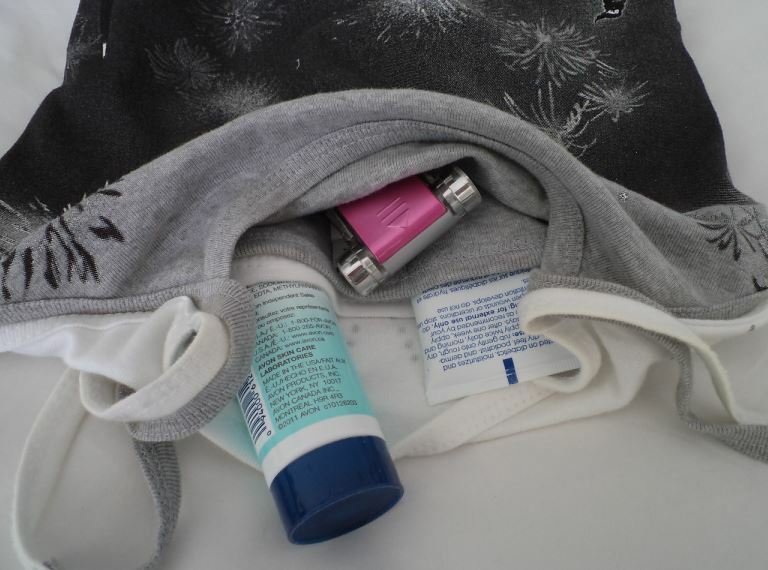 Guess what you can do with old t-shirts and tanks? When it comes to recycling t-shirts, I'm sure you've seen the braided headbands, the scrappy rugs and the t-shirt quilts. You've probably even seen jewelry items made with strands of jersey mixed in with chains for necklaces. I've long stopped buying t-shirts (and tanks, which fall into the same general category), but I have a bit of a collection and sometimes they are still being given to me. For example, my hubby makes regular trips to Las Vegas. I don't tag along anymore, having long ago tired of its excesses in everything. (It used to be the place to go for cheap eats and entertainment, but Vegas has transformed itself into a luxury destination over the past decade and I don't particularly want to partake of that when it's done with US dollars at a premium.) Anyway, even though I tell him not to bring me back anything, he very often stops at a certain shop where he can get three t-shirts or tanks for ten dollars or some other silly small amount. Some are winners and some aren't. And then there are those that are sized the same, but fit like polar opposites. Let's just say that I have a few that are just waiting to be repurposed into something other than t-shirts and tanks. When I did a search for what to do with them, I came upon some surprisingly upscale ideas. I'm featuring three of those here today — in quasi-tutorial style — after putting my own spin on a couple of them. NOTE: links to original projects can be found at the end of this post. This first one was a definite "must do" as soon as I saw it. Then it instantly sparked an additional inspiration. I knew exactly what I could use as source material, instead of just an ordinary t-shirt. 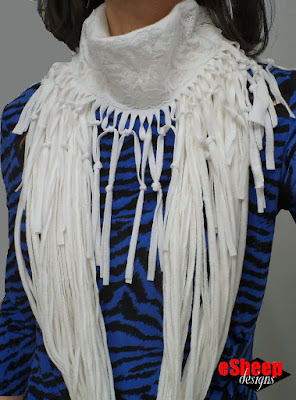 Take a look here at how you can turn a lace trimmed tank top into a lace trimmed fringed cowl scarf. Got this? Turn it into this! For a short time, I had one of these lace trimmed thingies in virtually every colour of the rainbow. I got them for like two for five bucks. Several of them have since been donated and I now have only four — and after this project, only three — left, the ones shown above and a black one. Since this recycle involves the bottom part of a shirt, I figured that the lace trim would make a lovely top accent on a finished scarf. Here's what I did. (If you look carefully, you can see that this was ready to be recycled; it had some coffee stains around the neckline that wouldn't go away.) First, I cut off the top part of the tank right under the arm holes. Next, I turned it around and sliced a series of 1/4 inch (6mm) wide strips that were 8 inches (20cm) long, starting from the newly cut edge. Because this isn't a traditional t-shirt and is fitted, it had side seams. Therefore, I started cutting straight strips where I could and dealt with the uneven remainder afterwards. Took some time, but it's all cut. Once the straight part was all fringed, I turned the whole thing inside out (to access the material around the side seams more easily) and cut the irregular remaining portion into strips as best as I could. 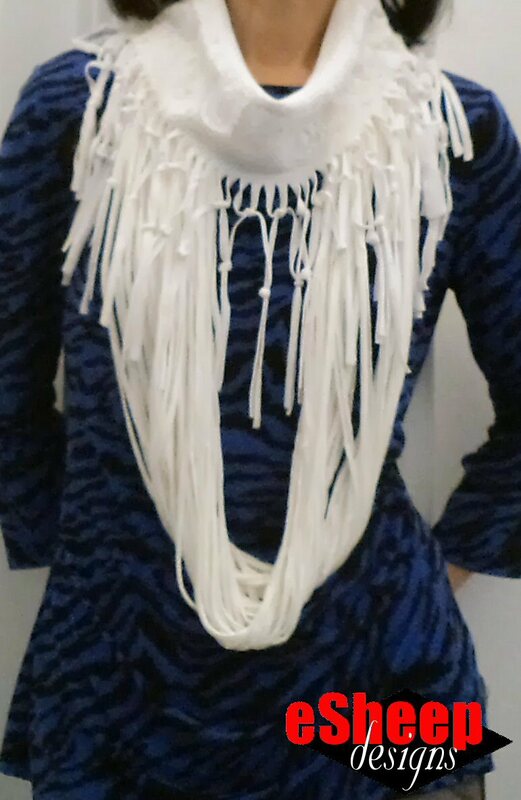 In any case, no one will notice that there are some oddly shaped fringes once the whole thing is tied. And that's precisely what's next: I tied the fringes in pairs all the way around and then went around a second time, as shown here. The knot-tying was a bit time-consuming (says the person who tied it, then untied it, in order to re-tie it), but well worth the end result. For the best effect, it's kept inside out so that the lace part can be turned right side out over the top like a cuff. Does that make sense? A lace trimmed cowl scarf recycled from an old tank top! Recall that I bought these tanks for about $2.50 apiece? I'm sure I could turn around and sell these cowl scarves for ten bucks each. (Yes, I regret having donated those others!) Now that's what's known as a true upcycle. 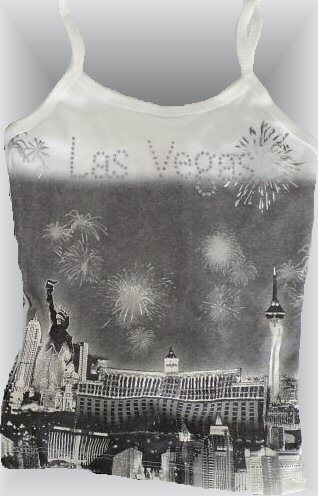 A t-shirt to tote bag idea made me take a second look at this tiny Vegas tank top. My thought was to sew them back to back, turning the whole thing into a bag with three sections, and then somehow rework the straps to make handles. And here is a picture of the three sections inside this bag. The inside of the two original tanks obviously form two of the sections. The third is formed by sewing together the sides seams of the two backs. Due to the limp nature of this fabric, the backs of the original tanks droop when you pick up the bag by its handles, but it still provides a certain amount of separation. Oh, and of course, the seams are totally visible inside. In the absence of any other ideas at present, I can see this being used as a shoe bag. During my search for ideas, I came across a blog filled with inspiration for converting t-shirts into other clothing. 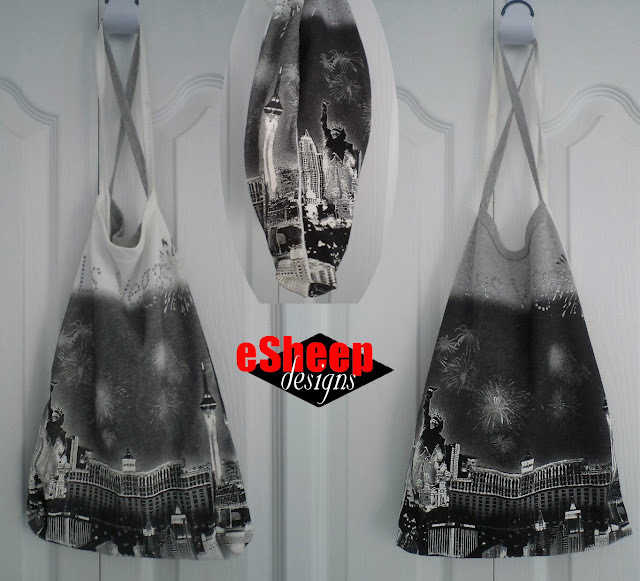 In this case, the blogger often uses new t-shirts (men's, typically) to make her fashion forward creations, but many of the ideas can be used on pre-loved garments. Here is one that I did almost as soon as I saw it. It's a fashion upcycle that can definitely be done on an old t-shirt. The one I sacrificed here was white with a fireworks print of the now defunct Las Vegas Riviera Hotel & Casino printed across the top. Size was a men's large, yielding not only a lot of strands, but quite a bit of length too, as you can see below. (I cut the strands 3/8" or 1cm wide.) It's fast, requires absolutely no sewing and creates a statement accessory that you can put on top of virtually anything to give it an extra kick. When you're done cutting, stretch the strips to transform them into curled strands... and presto, instant fashion! TIP: You may want to go outside for this part, because it'll start raining little particles of jersey all over the place when you tug on these. Not too shabby, huh? Fast and fashionable is a hard combo to beat! 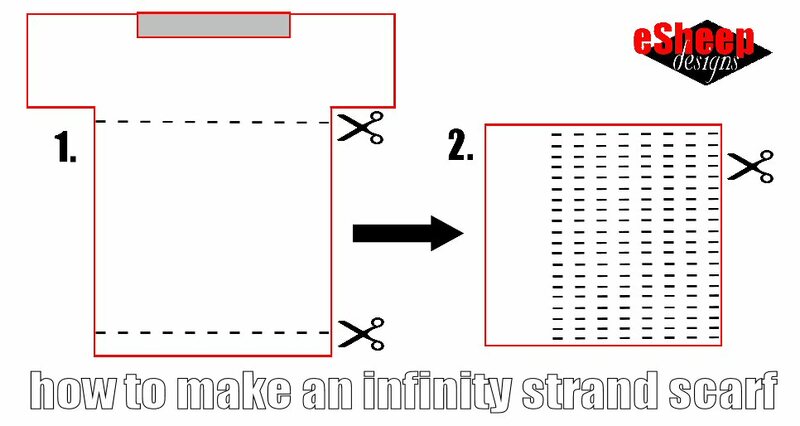 And speaking of fast and fashionable, I was so intrigued by all of these various techniques that I came up with my own variant of a T-shirt to infinity scarf transformation. You'll probably see it in a couple of weeks. As promised, links to all of the referenced tutorials follow below. The perfect project to share on Earth Day!